(Reuters) – A healthcare worker who had traveled to Saudi Arabia was confirmed as the first U.S. case of Middle East Respiratory Virus (MERS), an often fatal illness, raising new concerns about the rapid spread of such diseases, the U.S. Centers for Disease Control and Prevention said on Friday. The male patient traveled via a British Airways flight on April 24 from Riyadh to London, where he changed flights at Heathrow airport to fly to the United States. He landed in Chicago and took a bus to an undisclosed city in Indiana. On April 27, he experienced respiratory symptoms, including fever, cough and shortness of breath. According to the Indiana State Department of Health, the man visited the emergency department at Community Hospital in Munster, Indiana, on April 28 and was admitted that same day. Because of his travel history, Indiana health officials tested him for MERS, and sent the samples to the CDC, which confirmed the presence of the virus on Friday. The virus is similar to the one that caused Severe Acute Respiratory Syndrome (SARS) which emerged in China in 2002-2003 and killed some 800 people. It was first detected in Saudi Arabia in 2012. Dr. Anne Schuchat, director of the CDC’s National Center for Immunization and Respiratory Diseases, said on a conference call the first U.S. case of MERS was “of great concern because of its virulence,” proving fatal in about a third of infections. She said the case represents “a very low risk to the broader general public,” but MERS has been shown to spread to healthcare workers and there are no known treatments for the virus. In Britain, public health officials said they were contacting any passengers who had been sitting near the patient. Greg Cunningham, a spokesman for the Chicago Department of Aviation, said that the department “has been advised that there is no reason to suspect any risk at O’Hare,” Chicago’s main international airport. 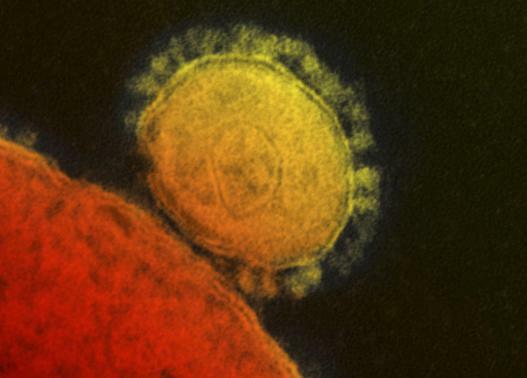 “There has only been one incident confirmed to have MERS, and he is hospitalized in Indiana,” he said. The hospital, located in northwest Indiana about 30 miles from Chicago, said it has been working with the CDC and the state health department, and will be tracking the health of the patient’s family members and exposed health care workers daily during the next two weeks to check for MERS symptoms. “This patient was not out in the local community and, therefore, any public exposure was minimal,” the hospital said in the statement. The hospital stressed that transmission of MERS requires close contact, and said the patient’s activities in the United States have been very limited, reducing the risk of widespread transmission of the virus. With the addition of the U.S. patient, 262 people in 12 countries have been confirmed to have MERS infections and have been reported to the World Health Organization. Of those, 93 have died, Schuchat said. Infectious disease specialists in the United States said that the fact the newest patient was identified quickly showed that disease surveillance was working. “One case does not represent a reason for panic,” agreed Dr. Wayne Marasco, an infectious disease specialist at Dana-Farber Cancer Institute in Boston. Marasco suggests that immigration agents should nevertheless be on heightened alert for passengers arriving in the United States after trips to the Middle East, especially Saudi Arabia. “They should ask, where did you travel? Have you had contact with animals, with anyone who was sick, and do you have a fever or cough?” he said. Marasco does not believe that thermal scanners such as those China and other countries deployed during the 2003 SARS epidemic would make much of a difference. That’s because the incubation period for MERS is two to 14 days, “so an asymptomatic traveler could make it through a thermal scanner,” Marasco said. The greatest reason for concern is that so little is known about this coronavirus. It has been found in bats and camels, and many experts say camels are the most likely animal reservoir from which humans become infected. Now that the United States has a case of MERS, there might be political pressure for that to change, suggested Lipkin, who pointed out that during the SARS epidemic, China was similarly reluctant to cooperate with western scientists. “Now the U.S. is going to be more interested. I think it will have an impact on the number of scientists here who will be encouraged to work on MERS and congressmen will stand up and rail about the importance of this,” Lipkin said. Previous PostComcast planning 8 million Wi-Fi hotspots in 19 major cities by year-endNext PostIs CryptoLocker Ransomware arriving on Android?